What exactly are seeds? The product of sexual reproduction, seeds are plant embryos that are protectively coated. Seeds have the ability to lie dormant, as they do when they are packaged and stored, until they are planted and germinated. When this happens, the seedling will emerge from the seed, and the miracle begins! There are two distinct types of seeds, based on the number of leaves they contain. 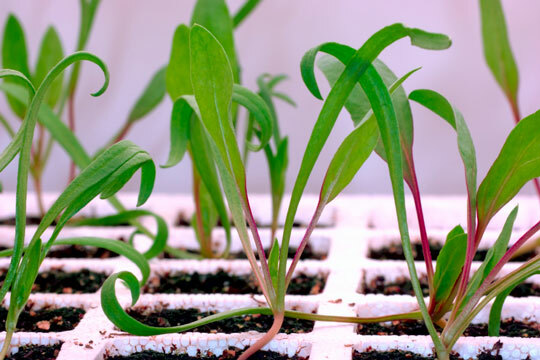 Monocotyledons contain only one seed leaf; they include non-woody plant groups such as grasses, lilies, and corn. Dicotyledons contain two seed leaves, and they include both woody and non-woody plant species such as oaks, maples, hydrangeas, and begonias. Gardeners love seeds because they are small, easily stored, and can be transported without undue concern. The gardener can pack seeds away until the growing season arrives, then plant them with the reasonable expectation that they will grow. 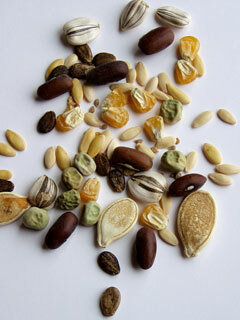 There are thousands of seed varieties, and some are easier to sow than others. Basil, marigolds, and other quick-growing annuals can be sown directly into the soil with little consideration. Shrubs, trees, and slow-growing perennials, by contrast, are more finicky and require supervision until they reach maturity. To begin germinating, all seeds need a balance of moisture, oxygen, and temperature. Some also need light. Seeds need moisture in order to start the germination process, oxygen to use stored food supplies, and a temperature that encourages germination. The right temperature will vary from plant to plant. Cool-season plants need temperatures of 55 to 65 degrees fahrenheit, while warm-season plants need temps of 75 to 85 degrees to germinate. 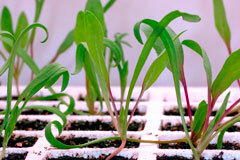 Seeds sown at cool temperatures, small seeds, and crops like lettuce also require light to germinate. Seeds can be purchased at your local plant or hardware store, or by mail-order catalog. Regardless of where you buy your seeds, the packet will contain important information like when to plant, how long it takes the seed to germinate, how far to space the seeds apart, and how long it will take for the plant to mature. Reading the seed packet carefully ups the odds of your seed growing successfully!